Would it be wise to believe that a primitive society erected one of the most mysterious cities, thousands of years ago, using nothing more than early Bronze Age tools? If not, who helped them carve and transport the largest stones in the world? In Lebanon, 4,000 feet above sea level, lies the mythical Baalbek, an ancient site with a history spanning over 9,000 years. It was an ancient Phoenician city, named after the god Ba’al. According to Phoenician legends, Baalbek was the location where Ba’al first arrived on Earth in ancient times, therefore the initial building must have served as a huge landing platform for the aliens who once visited our planet. This theory seems plausible because the stone blocks used to build the initial temple or city of Ba’al, are the largest that have ever existed in the whole world. The building blocks weigh about 1,500 tons and have a size of 68 x 14 x 14 feet. Beyond the remarkable size of this site, there is no information regarding its builders or the actual purpose the structure had served. The technique used for cutting those gigantic stones has intrigued researchers for many years now. 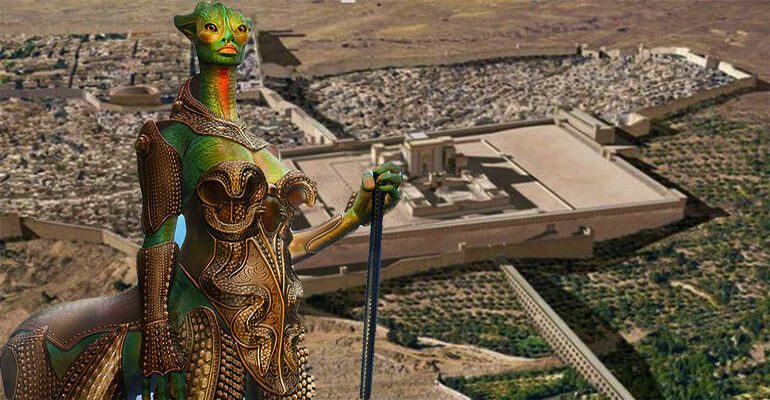 Because some ancient writings describe Baalbek as a landing place, the idea of a pre-existing advanced civilization, as well as alien technological support doesn’t seem far from reality. Evidence shows that the colossal stones at Baalbek were not put together by the Romans or any other civilization after Christ. While Roman technology at that time could cut stones up to 5 tons, we can’t explain who managed to shape the 1,500-ton blocks, considered the largest megaliths in the entire world. It is likely that the platform under Heliopolis – the name given by Alexander the Great after he conquered the area – served as the base for another timeworn temple that possibly the Egyptians or the Romans wiped out to build their own. The same area where Heliopolis was constructed was formerly used by the Egyptians to worship Ra. Now I wonder why they would build another temple on the exact same spot, unless that location was of extreme importance for some reason? Another interesting remark is the fact that, after the old temple was teared down and the Romans built Heliopolis, people were still worshiping Ba’al as well as other Greek and Roman Gods. Other large temples were built over this site, such as the temple of Jupiter – the largest of its kind, also temples for Venus and Mercury, a bit smaller in size. The rock quarry was located a quarter mile away from the area, meaning that the builders had to carry the colossal stones all the way to where the site is located. Another remarkable achievement is the precision of their stonework; the stones were set so close to each other that not even a sheet of paper could fit between them. The lack of references for building such a massive platform is extremely questionable. Why are there no records reminding of the original builders of the former temple raised before the time of the Romans and the Greeks, considering the amount of work put into it and the fact that this place is unique would make any civilization want to take credit for their astonishing work? It has become clear that Baalbek is an enigmatic and legendary site, used by various civilizations throughout thousands of years – The Romans, the Greeks, the Egyptians and the Phoenicians are some of the known cultures who used it and all of them worshiped Ba’al. Beyond these, we lack information concerning its origins or why the site was so relevant religion wise, although one thing is certain – the original design hasn’t been done by the Romans, and there is no other civilization that could had completed such a daring feat. These are not clumsy artifacts like Stonehenge. These are perfectly fitted 1,500-ton stones aligned intone of the biggest ancient foundation known to modern-day science. What exactly occurred that made the builders leave without a clue regarding their existence and what purpose the site once held remains a topic for debate, but up to this day, more questions remain rather than answers. Alexander: In the so called “Lost Book of Enki” it is stated the Baalbek was a landing platform for Anunnaki spaceships and Enlil’s abode. The Romans, during their occupation, have built temples on top of the abandoned landing platform.